June 21st to June 27th were days spent in the Russell Islands. They’ve been beautiful this trip. Only one day of rain has marred its scenic beauty and cool days have been the vogue. Most of the rats have been killed off but I still slept under my mosquito net. Have a horror of them running over me, and chewing on me as I sleep. They have a nasty habit of crawling under the Quonset huts1 to die. The stench is awful, and we, of course, find it necessary to drag them out for burial. Ugh! Have been on the beer unloading detail. Seem to catch it every time. Have been issued three bottles of cold beer every other evening. This is a rare treat when served cold. We even had fried chicken and ice cream again, which is really something. Our transfer looms nearer and nearer. It sounds too good, even though it chiefly entails strafing and cannon firing from the B-25H.2 The thing that appeals to me is the fact that our crew will always be together again. Tonight ends our rest and we’re all sorry to go. It’s been a peaceful ten days and conducive to good nerves. Bonnie, thoughts of you run in and out of my mind and my heart is filled with love of you. Good night darling, Sweet dreams. 1 A Quonset hut was a prefabricated structure, typically metal, with a semi-circular cross section. For additional details, see Quonset hut (http://en.wikipedia.org/wiki/Quonset_hut : accessed 26 June 2014). 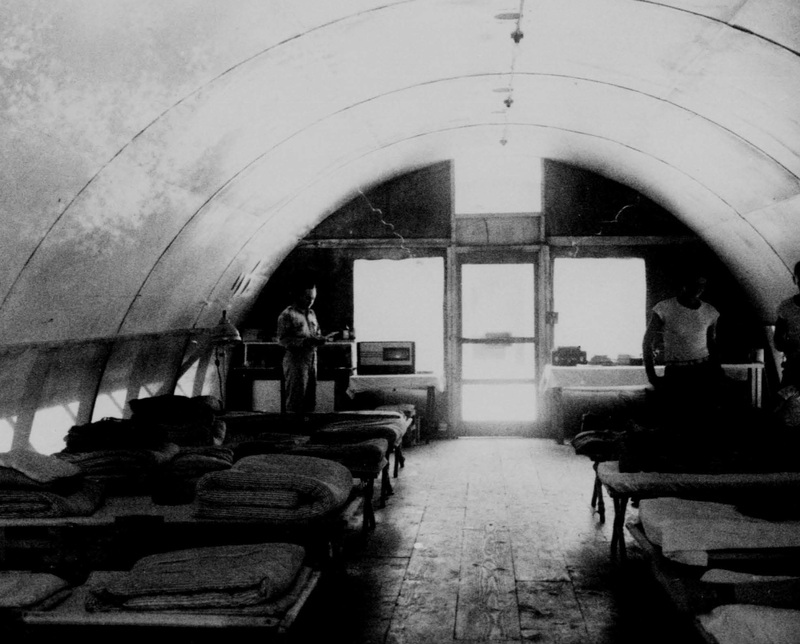 The photograph above is of the interior of the 42nd Bombardment Group’s sick ward on Stirling Island. It is typical, however, of enlisted men’s barracks. Note the screened opening at the end of the Quonset hut as well as how the lower section of the Quonset has been opened to provide for cross ventilation. Along the ceiling’s ridge are bare light bulbs. There is no privacy here. 42nd Bomb Group Historical Report for June 1944. Headquarters 42nd Bombardment Group (M), 1 July 1944, microfilm B0131, Maxwell AFB, AL: Air Force Historical Research Agency, 1973, frame 1800. 2 For a description of the B-25H, see https://waynes-journal.com/2014/06/18/june-19-1944/. 3 Wayne did not identify this gentlemen whose I kind act I would like to memorialize. Does anyone know who this might be, a Brigadier General who was in the Russell Islands on June 27, 1944? 4 The B-25H carried a normal fuel load of 974 gallons, which with a 3,000 lb bomb load, gave it a maximum range of 1,350 miles. For ferrying purposes, a 515-gallon fuel tank could be installed in the bomb bay. With the bomb-bay tank installed, the B-25H’s range was extended to about 2,000 miles. “North American B-25H Mitchell”. American Military Aircraft. (http://www.joebaugher.com/usaf_bombers/b25_15.html : accessed 26 June 2014). Prior to the removal of the fixed bomb bay tank, make sure that all the fuel has been drained. Open bomb bay doors a instructed in Section 4, Paragraph 16, and disconnect actuating rods from the doors to facilitate removal of tank. 1.Disconnect transfer pump electrical connection from jack on right-hand side of bomb bay. Remove drain line from the transfer pump. 2. Remove fuel hose from transfer pump to fitting on forward bulkhead. Then remove transfer pump. 3. Disconnect hose from vent fitting on top front of tank by reaching through door in crawl deck above the bomb bay. 4. With four men holding the tank to support it, one man can remove the 6 bolts attaching the tank assembly to the bomb bay. 5. Lower tank assembly to the ground. Temporary Handbook of Erection and Maintenance Instructions for the B-25 H-1-/NA Medium Bombardment Airplanes, AAF43-4105 to AAF43-4404 Inclusive. Inglewood, California: North American Aviation Inc., 1943. p. 301. This entry was posted in Uncategorized and tagged B-25H, beer, bomb bay tank, Brigadier General, fried chicken, Guadalcanal, ice cream, mosquito net, nerves, Quonset huts, rain, rats, Russell Islands. Bookmark the permalink. Wayne did not identify this gentlemen whose I kind act I would like to memorialize. Does anyone know who this might be, a Brigadier General who was in the Russell Islands on June 27, 1944? The thing that appeals to me is the fact that our crew will always be together again. …Except for the one that I told you about, all the veterans I met or read about always talked fondly of their crew members… They put their trust in them. One possible thought regarding the Brigadier General is that he may have been an MD. Your uncle does not mention any of the General’s staff, said he was a nice fellow, and also wrote they got into his truck. Many combat generals rode in jeeps in the combat zones or had officers waiting at his arrival – especially a BG – but always had several staff with them as they moved about. I hope that someone will be able to identify this man for us. He needs to be recognized for his humility and generosity.